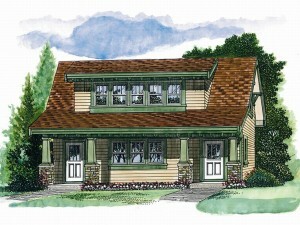 By building a carriage house plan from The House Plan Shop, you’ve added additional living space to your home, perfect for weekend guests, the in-laws or even rental property. The list below offers money saving tips to help you furnish your carriage house while creating comfortable accommodations without breaking the budget. · Survey the living space and determine what items you need. What furniture items do wish to have in each room? What size pieces do you need? How many beds do you need? What type of seating is necessary? A sofa or club chairs? Do you need a dining table or end tables? · Consider storage space. Often storage space is minimal in a carriage house so keep an eye out for items and furniture pieces that provide storage such as a trunk that could double as a coffee table or end tables that have drawers or doors with room to stash things inside. Likewise, watch for a sofa sleeper offering additional sleeping space for an extra guest or visitor while providing everyday seating. · Don’t expect to find the perfect furnishings. Rather, look for things that you can improve or change to suit your needs. In some cases you’ll need to do a little hard work yourself, but it will be worth it. Consider a new slip cover and throw pillows for a couch. Repaint a nightstand or a bookshelf. Buy a trendy lampshade for an old lamp. Refurbish a dining table. Sand and stain a nightstand. · Look for items that can be used for something else. Can bookshelf work for linen storage? Will a portable microwave cart add cupboard space to the kitchen? · Visit eBay and other online stores. Items sold on these sites are often in good condition and are sold at a fraction of the retail price. · Check thrift stores and resell shops often. They are always receiving new items, so stop in frequently. · Check newspaper ads for auctions and estate sales. They are great places to find pieces of matching furniture at a low price such as a coffee table and two matching end tables or a bedroom set. · Visit yard sales and garage sales early. They best items and deals go quickly so get there early to find the best furniture pieces at a great price. · Take your stack of mix matched dishes out of the attic and give them a new home in the carriage house kitchen. If you don’t have your own stash of dishes, check with friends and family. Someone will have a variety of dishes they aren’t using and may be willing to get rid of them. · Remember to inspect any second hand items for mold and insects. Clean them thoroughly before refurbishing them or arranging them in the living quarters. · Consider buying new small appliances and new linens. These items are often on sale for reasonable prices at your favorite department store. You’ll have peace of mind knowing small electrics, like the toaster and blender, will last a while and you won’t have to worry about your guests having any type of allergies to the bed linens or bath towels. Using a little creativity, imagination and ingenuity, you’ll have your carriage house or garage apartment neatly furnished in no time while keeping extra cash in your pocket. Spring is quickly approaching. Soon bike lovers will be dusting off their bikes and taking them for their first sunny ride. Whether you enjoy weekend bike rides with the kids or your friends or you plan to train for a bike race, now is the time to get ready. No one likes to hassle with getting their bike out of the garage, especially if that means you have to move boxes, toys, and the car to find it. Take some time to shop for a bike storage rack now. That way, when you are ready to ride, it will only take a minute or two to get your bike and start peddling. Bike racks and storage systems are available in a range of sizes and styles accommodating one or more bikes in a safe manner. Some options include vertical poles to which the bikes are mounted saving precious floor space in your garage. 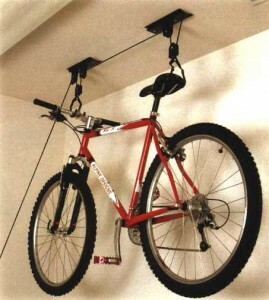 Others offer hooks by which bikes hang from the ceiling. Your specific needs and the space available will determine the type of bike rack that will work best in your attached or detached garage. Begin by determining how much garage space is available for bike storage and how many bikes you plan to store. Then, shop around for bike racks and storage devices to find out which ones will suit your needs and fit in the allotted space within your garage. Which ones are easy to use? Which ones offer the most safety and protection for the people, cars and other things in your garage? Do you want your kids to be able to access their bikes on their own? Is there ample room to open the garage door if you install a particular bike rack or storage system? Consider extra features that come with each bike storage system. Some come with hooks or shelves for storing helmets, shoes, water bottles and other gear. Is this something you need or want? If you want to add bike storage to your attached or detached garage, you’ll have to so some research to find the one that works best for your specific needs. Check local bike shops, home improvement stores and biking websites for ideas and possibilities.